I've been looking for something new for this spot for a while. Just as a reminder, this is what I had before. I liked the size, but wasn't crazy about the more traditional look with my new curtains and breakfast nook. So, walking through Marshall's the other day, these jumped into my cart! Not long after I saw that John & Sherry had tried one out, too, but they went another direction. I loved them for my space, though! I brought them home to try them on for size. Good, but still a little small. The only other option in the store was a narrower, longer runner, but I wanted to keep the width of these. They did, however, have one more matching rug, so I decided to use the extra one to do a little rug surgery! I laid the rugs out to eyeball a good length to get the most out of the extra rug. Then, I cut along the stripes, leaving about ¾ inch for a seam allowance. (I cut the hemmed edge off of the original rug, because the new piece would already be hemmed on the end.) In hind sight, I probably should have left a little more. These unravel terribly when cut. 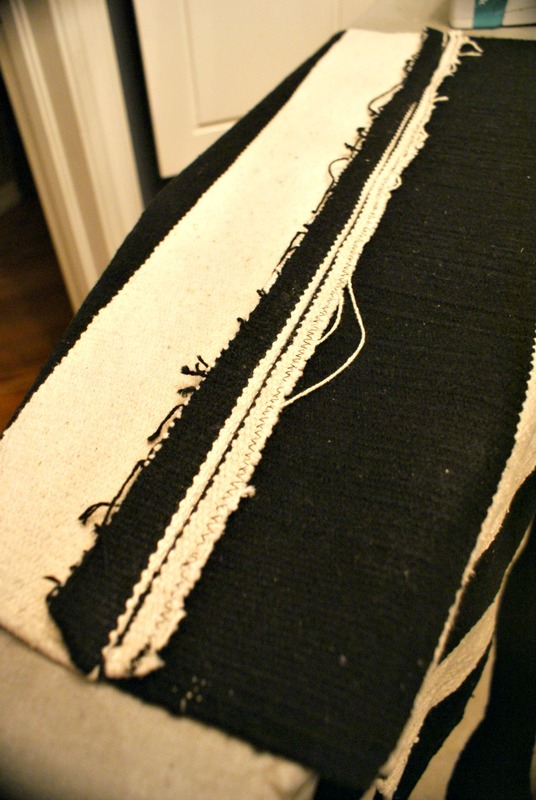 One of the rugs wasn't exactly the same width as another, so I stretched and pulled a little as I sewed and it came out ok. After stitching a straight seam to join the two, I went back and zig-zagged the edges to prevent unraveling. After pressing the seams open and laying the new rug flat, I couldn't even tell where the seams are. 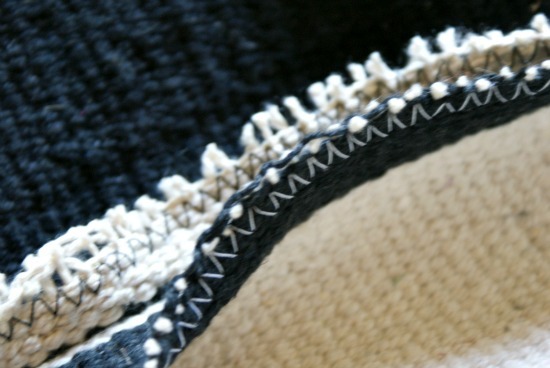 I think this worked so well because of the striped pattern where the seam could become invisible. Now they're just the right size, and with a rug pad underneath are nice and secure in place. 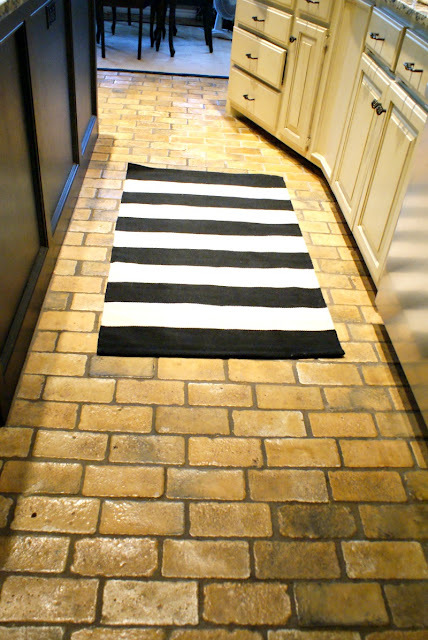 My only problem now is trying to keep stains off of those dog-gone white stripes! Why do spills ALWAYS land on the white...never the black? The fun modern pop looks great in your kitchen! Mine looks like your old one, and I've been on the hunt for one that would disguise dirt! 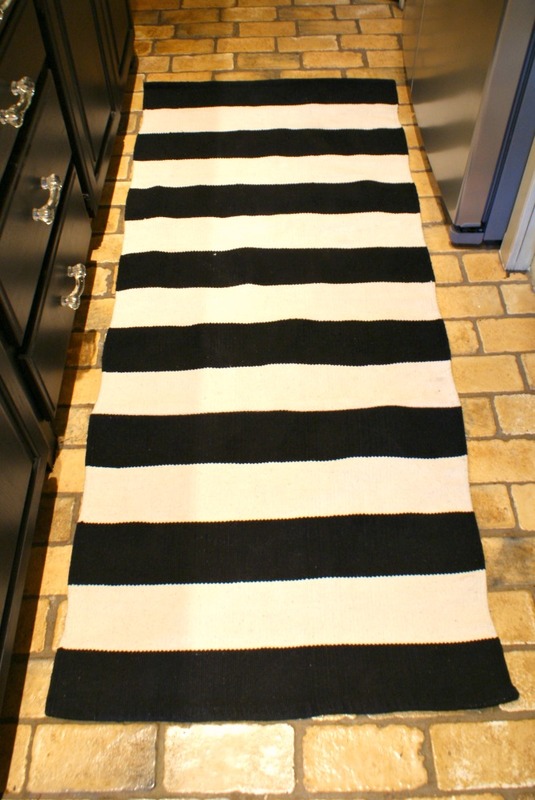 :) I 'sewed' two sisal rugs together for my family room a couple years ago, it was the only was to get the size I needed, too! I LOVE the black and white stripes!! 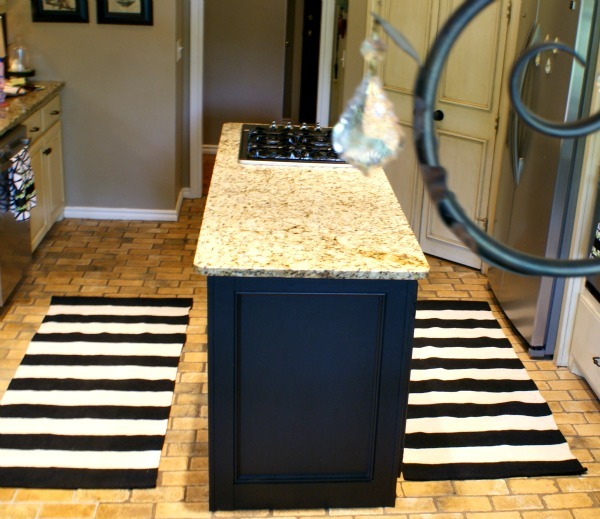 They look so great in your kitchen - a little punch of modern and graphic. 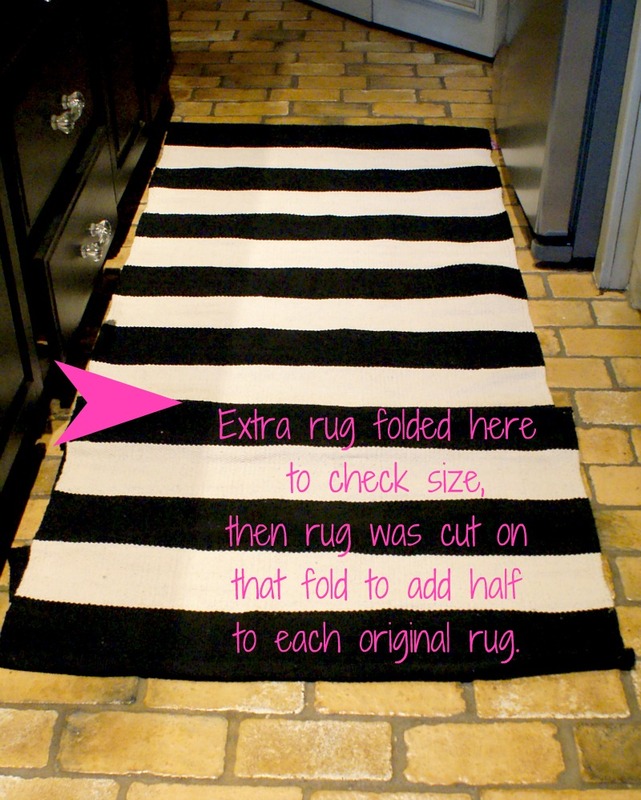 You are so clever sewing together two rugs - impressive! Hope you find some shade and misters at the amusement park today - have fun! Yet another reason I need to learn to sew! And so true about stains never falling on the black!! Girl, I've been doing a rain dance here for weeks now, I will keep you in mind next time I make the family do the dance as well ;) Crazy hot, and I don't like it! But I love your new striped mats, what a wonderful color combination, and how nice that you were able to fix your little problem. 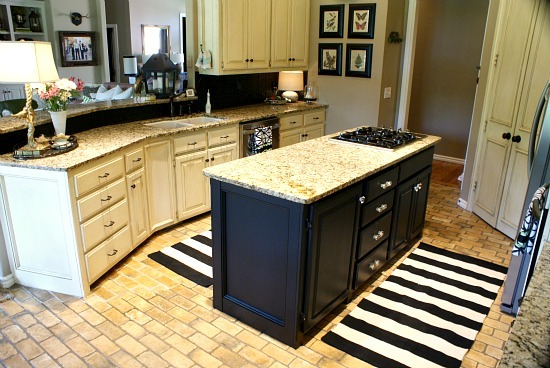 I happen to notice that your countertops look very similar to our new ones, nice taste. They look stunning! I adore black & white so they make me happy. :) You did a wonderful job and no, you can't tell they have been "adjusted". Great idea to doctor the rug!